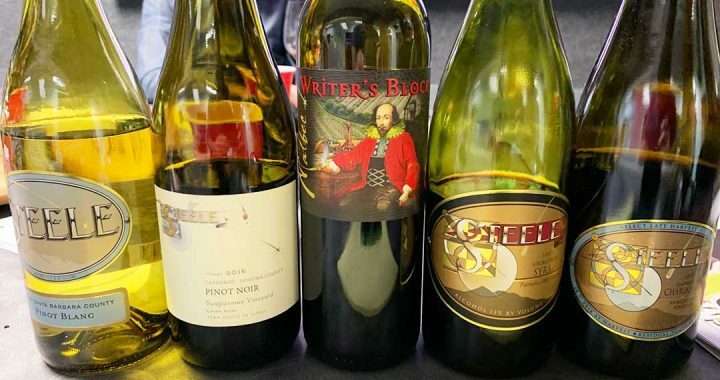 Jed Steele of Steele Wines is our guest today on California Wine Country with Steve Jaxon and Dan Berger, with Pete Foppiano sitting in again for Steve Jaxon. Jed Steele has been making wine for fifty years and Dan Berger has known him for a long time. Jed’s colleague Rusty is also in the studio today. Dan remembers that Jed made the first Ice Wine in California in 1975 and again a year later. It was made from Colombard grapes and they had to picked the grapes at 5am. They start by tasting a Pinot Blanc from the Bien Nacido Vineyard in the Santa Maria Valley in Santa Barbara County. They make the juice there and chill it to 35 degrees then ship it up to Sonoma County for production. He uses all old French and Hungarian barrels and goes through Malolactic fermentation. Dan says Pinot Blanc is under-rated. Jed is making wine from Lake County, especially his Cabernet Franc. It’s not at all like Cabernet Sauvignon. Jed’s tasting notes include honeydew melon and Dan agrees with that. Jed Steele makes between 500 and 1000 cases of this. Dan thinks scallops would go well with this, or anything delicate, to match the delicacy of the wine. The tasting notes also mention green apple, and Dan also notes some lemon. The marketplace has changed in the last 3 or 4 years. Millennials are looking for a diverse selection of varieties and styles. They want things that are not common. The traditionally top selling Chardonnay and Cabernet are still selling but not as much as a few years ago. As people are reaching out for diverse wines, Pinot Blanc is a good one to fill that bill. Jed’s first vintage as a head winemaker was 1974. He consulted for 15 years to Chateau Sainte Michelle and also for the Fess Parker family. Dan says that if you’re looking for forward-thinking, modern style winemaking with mature vineyards and some grapes that are not particularly well-known, that’s what Jed is doing. Jed mentions Blaufränkisch and Aligoté. Next they taste the 2016 Pinot Noir from a vineyard that was first planted in 1998. Dan likes the slightly Burgundian characteristics. “These grapes have finally settled down.” Jed tastes bing cherries and Dan tastes light blackberries, which is rare in Pinot Noir. There is no noticable oak. It is all fruit. It has so much vibrancy that you will want it on the dinner table. Dan calls it white wine with color and Jed agrees. The grapes are from the Sangiacomo vineyard. They lament that the wine trade and buyer demand tend to favor newer wines, which is a shame because that sacrifices the time that it takes for wine to mature and develop. Now to illustrate good aging, they have a 1997 Syrah which Dan says is fabulous. It has not lost any of its fruit, the acid is still holding it together and the tannins have subsided. Barry asks Rusty about it, who notes that 22 years ago Syrah was rare in California. Jed remembers that 1997 was his favorite harvest ever. There was a perfect storm of weather and they got quality and quantity. The aeration is helping it too, and the complexity comes out after about 20 minutes, without sacrificing the fruit. Dan says it’s not available anymore but Jed says he has a case or two left. Next they pour a Malbec. Pete notes that it’s not a widely produced wine. The Argentine Malbec is popular, because it’s inexpensive, but they are one-dimensional, all fruit. But we are getting a better understanding of how it should grow. This one is from Lake County. There is a little blueberry note. The grower has 800 acres of Cabernet and 10 acres of Malbec. Dan says that California Malbec has a vibrancy that other Malbecs do not. Jed Steele uses French, Hungarian and American oak. They wrap up with a dessert wine, a 22-year-old white wine. It has aromas of dry peaches and apricots, with pineapple notes. It has high sugar and alcohol and Jed didn’t know that it would age this well. Dan Berger says this is an example of a wine that younger buyers today are interested in, something uncommon. There is more interest in Rosé and in unusual grape varieties. For example he saw some Rosé of Barbera the other day. Also, obscure grape varieties like Négrette, Fiano, Arneis or Viognier. Younger buyers are looking for something unusual and that has unique characteristics. These buyers aren’t only interested in high scores or reviews, they want something new and different and exciting.